We all make bad decisions. But the funny thing is that bad choices never seem like bad decisions in the moment. Sh*t happens (the above examples are all about me). But the funny thing is that bad decisions never seem like bad decisions in the moment. I’ve been reading about the decision-making process of Warren Buffet and Charlie Munger, two of the most successful investors of all time. You can never avoid making a mistake. However, you can do your best to avoid making dumb decisions. Plus, by learning from other people’s mistakes, you can make their mistakes your own. You’ll learn faster that way. Smart people are way too preoccupied with doing the right things. They want to have the perfect life, career, house, business, car, holiday, etc. When you put too much pressure on yourself to make the right decisions, you get analysis paralysis. We both laughed our a**es off. I can do the same with overthinking. And I bet you’ve been there too. When you overanalyze every single decision, you become paralyzed. The result? Nothing. Now, that’s a bad outcome! That’s how people end up wasting their lives. The only way you can stop overthinking is making yourself aware of your thinking process. When I asked my friend about his thinking, he became aware of how irrational his process was. Do This Instead: Make Small Decisions. Decide Often. I recently read Seeking Wisdom by Peter Bevelin. It’s about the way Charlie Munger thinks. One of his decision-making strategies is to avoid mistakes. But that can be interpreted in different ways. 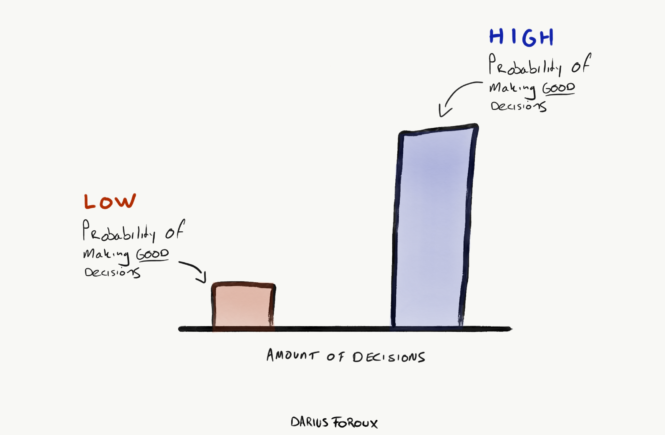 When you make small decisions early, before they become big — it’s easy. When you put off decisions, they become big — and painful. For example, I’m not happy with the email provider I use to send out my newsletter. Their support is slow, there’s no good integration with my online courses platform, and readers have complained about not getting my newsletter. This is something that’s on my radar for more than 1.5 years. At the time my list was less than half of the size it’s today. I also had only one online course. Now, I have three. The hassle of moving to another provider gets bigger every day. Had I moved early, it was easy. By now, it’s a painful process. In life, it’s exactly the same. The longer you stay in a bad relationship, the harder it gets to leave. It’s also true for your job. The earlier and more you decide, the more chance that you make better decisions. I often say that there are no right or wrong decisions — only decisions. That’s not entirely accurate. Of course, there’s a difference in the quality of our choices. That’s the topic of another article. But here’s the thing: NOT making a decision is also a decision. If that’s a conscious move, that’s okay. You think about something, and you decide that doing nothing is the best option. No matter what, you’re making decisions all the time. Instead of making fewer conscious decisions, we need to make them earlier. Because all you need are a few good choices in your lifetime anyway. What will be your best? You only find out after, you guessed it, you’ve made a decision.